For the first time on The Football Coaching Podcast, we’re doing something a little different. 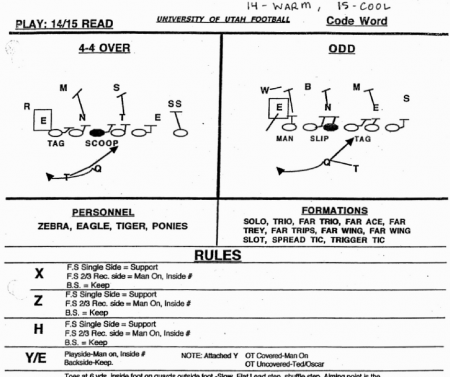 I’m breaking down the 2004 Utah Offensive playbook. Urban Meyer was in his second year at Utah, running this Spread Option attack. Even though it’s the standard of college football today, this was an innovative and unique offense in 2004. When I’m looking at this playbook with you, all I’ll talk about is what I would want to steal. For my own players. You will not hear any talk about the athletes at Utah, or even Urban Meyer himself (except for a few shots at Florida, because I couldn’t resist). It’s about what football coaches can learn from an old playbook. You’ll hear about the program philosophy as presented in the playbook. We’ll talk run game including those Spread Option plays – like that shovel option everyone’s so excited about today. Then I’ll look at the passing game that Utah was using in 2004. And why it was so effective. This is a great offensive playbook to examine for coaches. Even though it seems complex watching the offense on TV, the truth is that the Utes kept it simple. There are just a few schemes for players to learn. In reviewing a Utah game from 2004, I saw that they really stay true to the simplicity in the playbook, too. You don’t need a lot of plays to be extremely successful! Get Instant Access to my Pistol Power Offense video series at no charge. I’ll detail the Power blocking scheme that is the foundation of Utah’s Shovel Option, along with a Counter and Power Pass (Utah uses the Power and the Power Pass, but there wasn’t a Counter in the playbook).